Have you ever had a beloved dog go missing? When I was growing up, my family’s Australian Shepherd dog named Caesar went missing from our walled in back yard. Back then, there was no social media and no microchipping. We searched everywhere for him, but he was never found, and his disappearance remains a heartbreaking mystery. You wonder if your pet is still alive. If so, are they well cared for? Did they end up in a shelter? 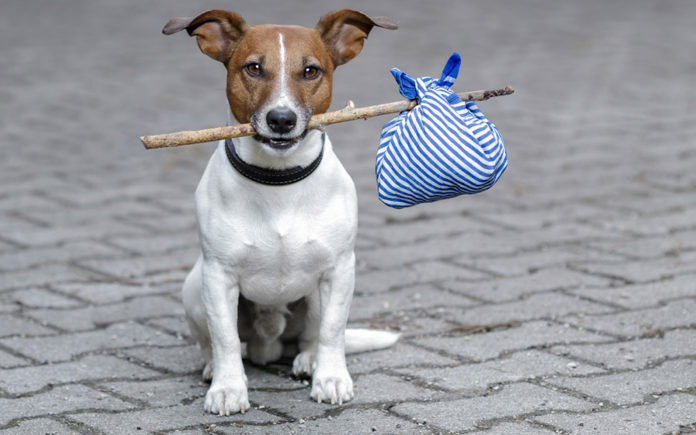 Here are some tips should your dog go missing, and some things to protect him in advance. Dogs need to wear a collar with an engraved ID tag with their human’s cell phone number at all times. This enables anyone finding him, including animal control, to contact you immediately. PetSmart and Petco have machines that engrave tags with phone numbers and pet’s name. Any veterinarian can microchip your pet with your contact information. Boiler plates to make flyers with your dog’s photo can be obtained from www.bestfriends.org or www.petbond.com. Find a teenager to help you if you are not compute savvy. It helps if you indicate there is a reward. Post flyers on local bulletin boards including Petco, Starbucks, vet clinics, grooming salons, and telephone poles in the neighborhood where he went missing. Be sure to post a flyer on the lost & found bulletin board at your county shelter. Pass out flyers to postal workers, gardeners, utility workers, tree trimmers, security guards, and others who spend time outdoors in your community. Take a current photo of your dog NOW so that you are prepared. Signs can be posted on telephone poles with a staple gun, in areas where school children gather, at dog parks, and at intersections controlled by traffic lights. You need to make big, colorful, eye catching signs. Post your dog’s photo on Facebook and ask your friends to SHARE and TAG. This is a way to reach a large number of people in your community and beyond. Ask local animal welfare groups to post on their pages. Include your telephone number and the city where the animal went missing. Local communities have Facebook pages designed to reunite missing pets with their owners including LOST & FOUND PETS IN THE COACHELLA VALLEY. Post your missing animal on www.pawboost.com. Post an ad in the local newspaper in the “missing pets” section. Thousands of missing pets found their way home through www.Nextdoor.com, a free private social network for your neighborhood community. This is also a great site to post a stray animal you find. In many cases, your dog is somewhere in the immediate neighborhood. Search a 20-block radius within your home by car and on foot. One dog jumped out of a shopping cart in the Walmart parking lot, only to be found a week later still hanging around behind Walmart. Call his name loudly as he could be in someone’s back yard. The best time to search is early morning or at night when there is less noise. Children are often a good source of information about pets in the neighborhood or stray animals they have spotted. Go in person to your local public shelter since you are the best one to recognize your pet. All shelters check for microchips and ID tags, but sometimes collars and ID tags get lost. Return to the shelter every few days. Check shelters within a 50 mile radius in case he was picked up by someone traveling. Check their “Found” book and the “Dead Animal” book. Check Craigslist for “FOUND” animals. Be sure to check the section for “animals for sale”, in case someone picked up your animal and is trying to sell it for profit. Cut up a piece of clothing that has your scent, such as a T-shirt, and leave small pieces of the garment over the blocks leading up to your home. Dogs have an incredible sense of smell, and this may lead them back home. Gather friends to meet at Starbucks. Supply them with coffee and arm them with flyers. Map out the area each person needs to cover. Most missing pets are returned to their owners within a short time, while others show up months later. Some that are microchipped turn up years later in shelters thousands of miles away. Unneutered male dogs are much more likely to run away, yet another reason to sterilize your pet. Please email me any additional ideas you have to locate a missing dog.